It all started in 2010 with a goal of having fresh fruits and vegetables for Maria Alonso son. He was suffering from intense ADHD symptoms and the doctors were recommending either medicine or a change in diet. Alonso chose the latter due to her available financial resources and her drive to garden. “I was given two small plots at a nearby school but quickly outgrew them,” said Alonso. She recognized not only her son’s needs but that of her fellow community members that did not have a quality source for healthy foods and snacks and were suffering from chronic illness.. Being located near Ontario International Airport, close to Los Angeles, the area is primarily commercial and there aren’t many grocery stores in the area and no organic food options in any stores. After only a few short months, Alonso realized she needed to start looking for more space. The city offered her to use an abandoned parcel of land adjacent to a public park and surrounded by homes as part of a larger public health initiative. The land was perfect because of its size, access to water, was visible, provided a safe space for kids, and, best of all, the land was free because the local city couldn’t sell it and wanted it developed for public use. Alonso turned her community garden into a nonprofit called Huerta Del Valle “The Valley’s Orchard.” She started applying for community assistance to develop the space. With the generosity of Kaiser Permanente, Alonso was subgranted start-up funds through Kaiser’s HEAL ZONE Initiative. Alonso was able to purchase needed supplies and equipment, and pay a small staff and interns to support the program. Since, Huerta del Valle has been able to secure a USDA National Institute of Food and Agriculture Community Food Projects grant, and other grants resources to increase staffing and enhance projects. NRCS came into the picture when the farm became interested in adding a hoop house to extend the growing season and provide an environment for more tropical crops, including papayas. NRCS has helped the farm implement a suite of conservation practices, including mulching, irrigation water management and nutrient management. “Huerta del Valle is committed to making a positive impact on their local community by producing food that’s grown with practices that conserve and enhance the precious natural resources in their farm,” said Tomas Aguilar-Campos, Redlands district conservationist. Today, more than three acres are farmed with more than 150 diverse vegetables, fruits and herbs, including edible cactus and sugarcane. A small CSA provides weekly vegetable boxes, vegetable beds are rented out to community members for a nominal charge, anyone can walk up and purchase crops for a mere one dollar per pound, and additional crops are sold at nearby farmers markets and restaurants. The youth internship program provides hands-on garden/farm experience, teaches small business skills, and how to communicate with customers. With the help of NRCS conservation assistance, interns also learn about the fundamentals of conserving water, soil and plants. Alonso and Levine were recently approved to replace their old tractor with a cleaner-burning unit through our National Air Quality Initiative. 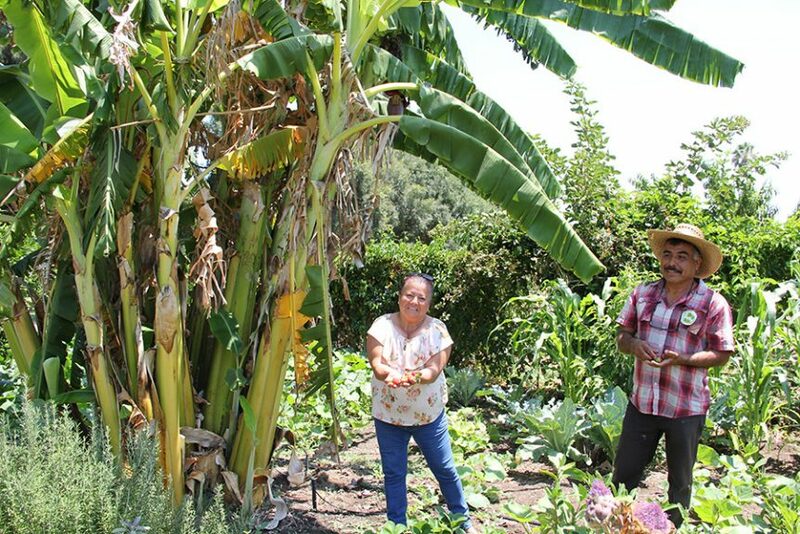 In addition, Huerta Del Valle is working to take over another nearby vacant lot to expand the community farm and hope to gain NRCS’s technical and financial assistance to make it successful. Image credit: Huerta Del Valle “The Valley’s Orchard” website image.